Solve puzzles with cute girls and a guy. Two teenagers deal with mental health problems and school. A short jam entry about a writer meeting an unlikely friend. Once you download the ZIP file, you need to right click -> extract the folder. Then, open the newly extracted folder and click the application inside it! Hiya! I'm MikomiKisomi, the solo owner of Crystal Game Works. I'm currently a (junior) college student with a passion for making games and I've been making them ever since 2015. I've released several games here and several you can't see on my profile, most of which are Ludum Dare entries- I've been entering every time since #30. On my page are several VNs- some are yuri, one is a work in progress dating sim, one is a commercial romance VN, another is an emotional and short VN, along with others there. I'm currently working on 3 games, with 1 set to release by the end of the month and another set to release around summer. 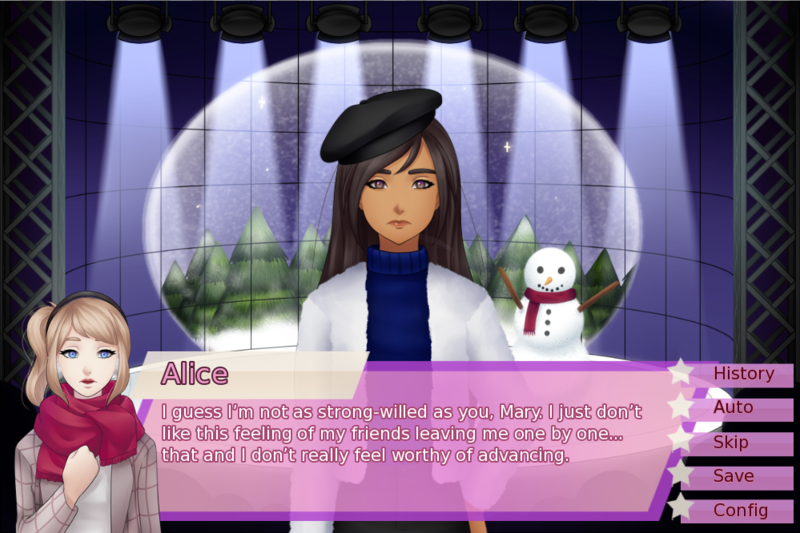 A free idol visual novel releasing by the end of the month for NaNoRenO visual novel jam 2019. 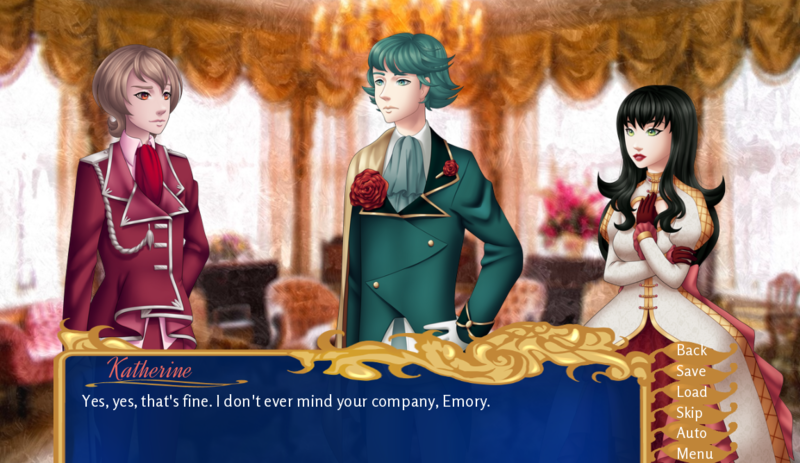 A free royalty slice of life dating sim releasing around summer. Also has the same artist as Alice in Stardom, Violora. A commercial 10+ hour long constellation-themed visual novel RPG about fighting monsters in the dark and the Zodiac. So... why am I not at GDC? I'm a college student! Do you think I can even afford the plane ticket?! All jokes aside, I hope everyone at GDC is having a great time and those of us who aren't there are still able to learn a few things about the industry and practices at home. Hi! The full game has been finished and is available here! Hi! Could you show me the error message? We actually hadn't thought about that! We'll consider adding it to the full game. Weird! I apologize for the error and I'm looking into it- I'll reply back as soon as it's fixed! Fixed it- thank you for telling us! We don't have a projected release date just yet but the assets for the full release are about halfway done! About a decade ago, there was basically no such thing as "English visual novels", much less the notion that they could make money and even become successful. Now, thankfully, it seems every year we step closer and closer to becoming much more recognizable rather than the tiny niche we started from, and I also can't wait to see the field grow. Ah, how weird! Could you please email me a screenshot of your receipt/showing where you paid for it to kaylinb.usiness@gmail.com ? I'll try to fix this as soon as possible. Sorry about the confusion! Hi, thank you so much! The actual demo for the full game is on this page- the pixel RPG "demo" was the original concept for the game made for a game jam but was fleshed out further into a visual novel, so it is just a proof of concept now and not a good representation of the full game. Yes actually, the game is almost done being expanded on and finished, but I've ported it to Ren'Py. A new demo similar to this build story-wise is available for download on this itchio page, and the full game will be done sometime in April or May and will cost $9.99. No problem, hope you like the game! X to open up the menu where the Save option is. Z is the back button to get out of the menu. AOPII community · Created a new topic Spoiler Section! This is the general thread for posting about the ending and other spoiler things, so we'll start it off with a question- what did you think about the ending?